I did the first block of Gail Pan's Christmas BOM... but I did mine in Red and Turquoise. 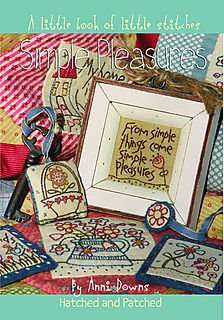 I did 18 tiny embroideries from this book... I also finished two Cinderberry Cushion panels, the Red Delicious block of the month number 3, and started the first two blocks for the Breast of Friends Block of the month from the Homespun magazine. All in all very productive! Perfect for fat old pregnant lady in the hot hot summer. You are being very prolific! !